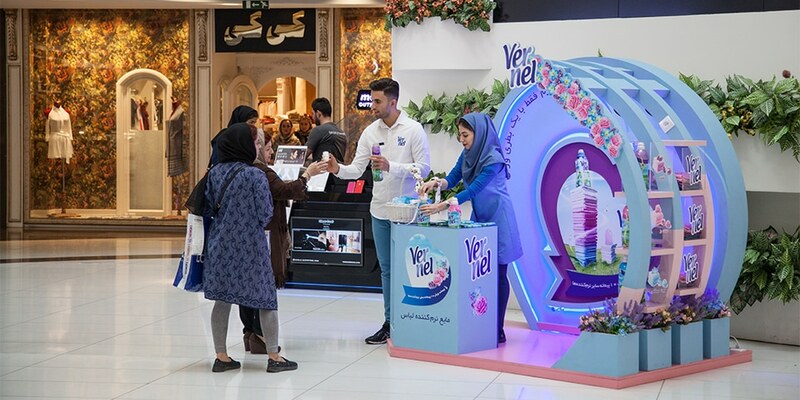 Vernel brand of Henkel Co.
Vernel Brand, the softener of the clothes that just entered the Iranian market, picked up the sampling method and increased audience experience to raise awareness about his distinctive concentrate formula. The main issue was to achieve these demands through the designing a booth. The product sampling should be done in a beautiful environment. The project was expected to be interesting, influential and informative. It was also expected to create a lasting image in the mind of people. 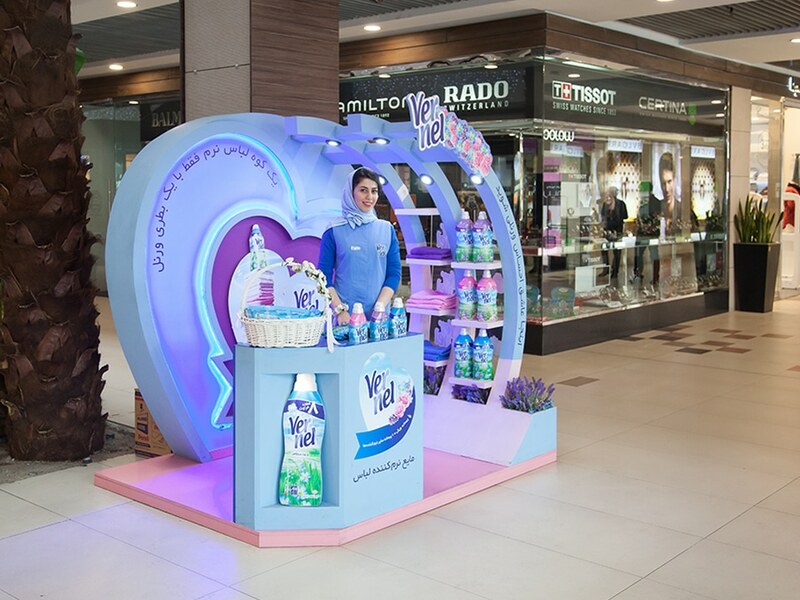 To achieve the desired result and impact, spaces in large shopping centers (such as Kourosh, Arg and ... in the cities of Tehran, Isfahan, and Shiraz ...) were considered in order to create a stronger connection between the brand and the audience through a beautiful booth in those places. Items such as the logo, master visual, slogan, heart shape, flowers and colors of the products were the ones used to design promotional items for this product, and they also had a bold presence in order to coordinate with brand identity. In spite of the small space available, space was used as best as possible to make the elements to be clearly seen. With the optimal use of space, the main goal of this project, which was the sampling and branding, was well answered. 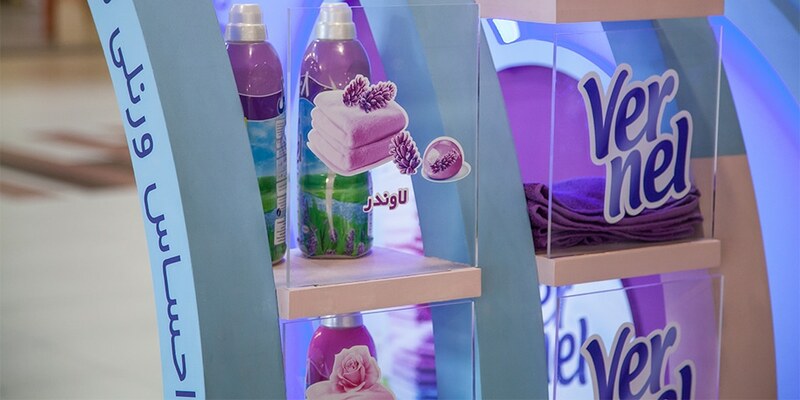 Aromatic towels of the product fragrance were placed on the shelves to indicate the result of the product use. By spreading the product's aroma into space, it has also been used to make a good and pleasant impression on people. On the other hand, a special slogan (here you fall in love with Vernel feelings) was written to get more attention and making more influence in the mind of the audience. This slogan was applied on the structure of the booth. 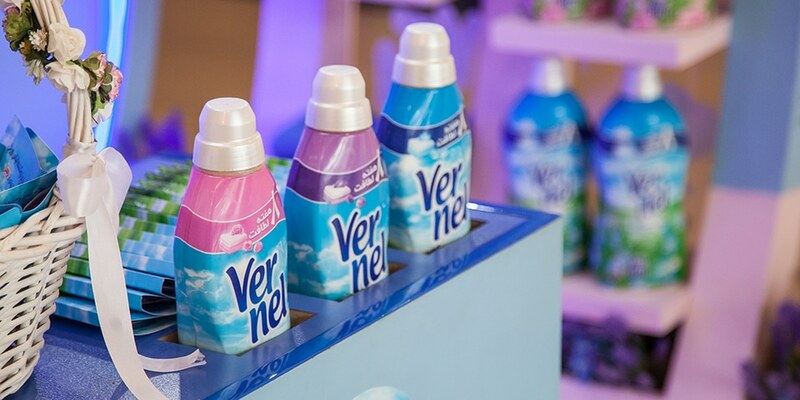 Brochures containing more descriptions of the products of the Vernel have been delivered to the audience to complete the tips explained by the promoters and also a product sachet was given to people to enjoy the product for free. Also coordinated uniforms with brand identity were designed for promoters. As a result of these activities, more than 400,000 samples were delivered to brand’s target group in malls, retail stores, women cloth stores and organization in targeted cities which helped the mental contribution of audiences and sales of the product.